The Coming Soon page of a website plays an integral role in building a solid online foundation for your business or organization. It does not only let people know that you are up to something, but it also jumpstarts your business on the World Wide Web. Furthermore, most websites come to a critical turning point of redesign or re-branding as new technologies in web design, such as a responsive design or a one page parallax layout, emerge and become popular. Therefore, a Coming Soon landing page, which can also be used as an Under Construction page, can be very useful. A Coming Soon page or Under Construction page lets you notify your users what you are coming up with something and it piques their interest. Instead of turning them off with a 404 error page, a Coming Soon page allows you to show a glimpse of your work in progress. That is why we have collected some of the latest and best selections of Coming Soon HTML website themes and templates below which might be very useful before you decide to start building a new website or update your existing ones. Packed with lots of features and the latest trends in web design nowadays, these Coming Soon website templates will surely do wonders for your marketing endeavors. First on this list is Alice, a collection of one-page website templates with 10 home page variations including a dark and elegant Coming Soon page. It is built with Bootstrap and uses valid HTML5, jQuery, and CSS3 smooth animation effects for additional visual value and ease of use and customization, along with its minimalist design and clean layout. 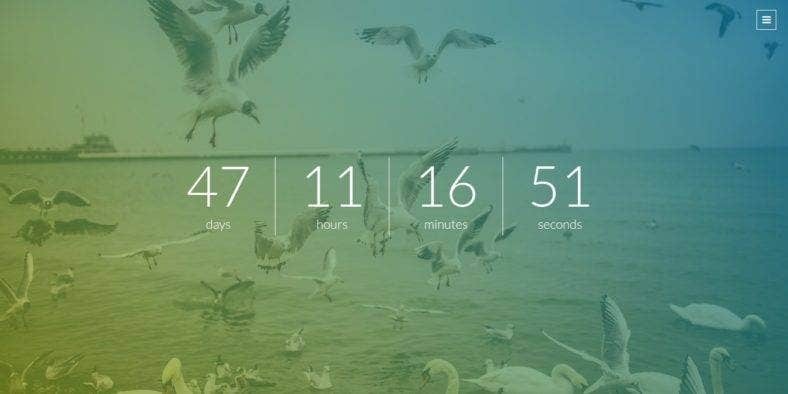 The Coming Soon page included in the package features a simple but beautiful round countdown timer and details button in order to provide your visitors more essential information about your website. Alice also includes modern and trendy attributes such as a fully responsive layout, custom and revolution sliders, parallax background, popup gallery, and many others. Second is Gecko, an ultra-responsive Coming Soon page template with a clean and dynamic design integrated in all the 28 variations of its four-color palette. Its huge set of design options allows you to find the perfect Coming Soon page that suits your taste and is just right for your business, corporate organization, agency, studio, blog, or personal website. Built with W3C valid HTML5/CSS3 code on the Bootstrap framework, Gecko boasts of a fully responsive design that adapts well to any device as well as its easy customization ability. It also features a working Ajax subscription form, PHP contact form, and Mailchimp functionality. Next is Ultimate. Just like its name, this Coming Soon website theme is the ultimate choice for many kinds of websites for different business niches. With 56 demo versions to choose from, you will be able to find the best Coming Soon or Under Construction theme for your creative, agency, business, personal, event management, portfolio, blog, or other type of website. 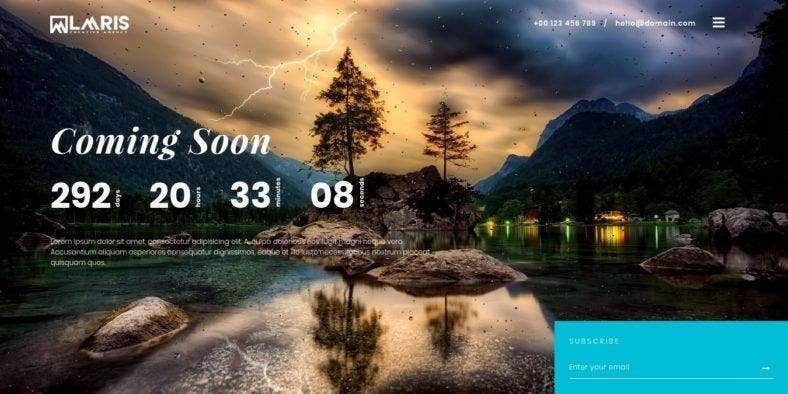 A powerful HTML5 Coming Soon page template, Ultimate can also be used as a landing page for product launches or event announcements with its Mailchimp-integrated and Ajax subscription and contact page-incorporated layout. Additionally, it has a highly responsive and mobile-optimized minimal design with stunning animation effects and modern functionalities. Then, we have Laaris. 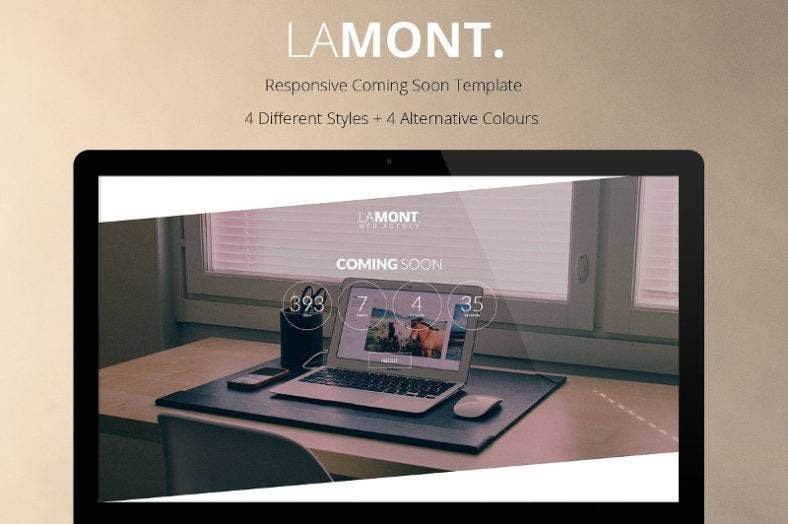 This colorful and multi-layout Coming Soon template is built with Bootstrap and coded with valid HTML5 and CSS3 code. These make this theme highly responsive and adaptable to all screen sizes of various desktop and mobile devices. It also allows you to easily use the template and customize it. Among its features is the simple and sleek countdown timer enhanced with a stunning full-screen background which supports different media content types such as a slideshow or video background. It can also be integrated with gorgeous animation effects such as Triangles and Particles. Here is an ultimate Coming Soon template that you should not miss. With over 52 designs and ideas to choose from, you will have a lot of choices for whatever type of website you have, be it business, agency, hotel, restaurant, tours and travel, corporate, personal blog, portfolio, and so much more. There is always a template to match your brand image with Marshall. The template comes with a superbly responsive design with lots of modern features included in the package. These features include a dynamic Contact Form, Mailchimp integration, Instagram feed, WebGL, Goole Web Fonts, and Font Awesome icons, among others. Marshall is also optimized for mobile use and has an all-browser support, so it’s fast loading and very efficient. Evolia is a powerful Coming Soon page especially built for fashion, photography, and eCommerce websites for any types of industry looking for a highly creative and professional-looking template design. This one-page HTML5 Coming Soon landing page theme boasts of multipurpose features and customization capabilities. Included in these features are the one-page layout, sliding header background and custom backgrounds, a stunning countdown timer, an About Us section, Flickr feed, social media links, Google maps, and a Subscription button. It also has a responsive design which allows your page to be viewed beautifully on all kinds of devices with different screen sizes. 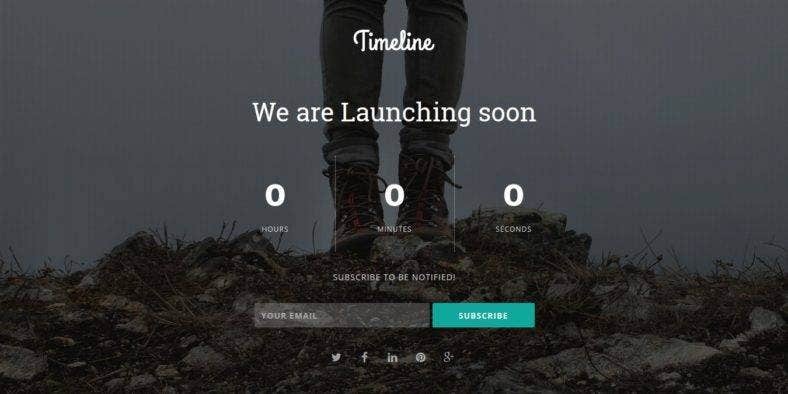 A modern and creative Coming Soon and Under Construction template, Timeline comes with a number of contemporary web design features such as a countdown timer, an About page, a pre-loader, an Ajax newsletter subscription form with validation, and more. It also features an ultra-responsive design which makes it suitable for all kinds of devices, whether desktop or mobile. Timeline also includes a bunch of design options like the full-screen image, image slider, or YouTube video backgrounds, hundreds of Font Awesome vector icons, Google Web Fonts, and many others. 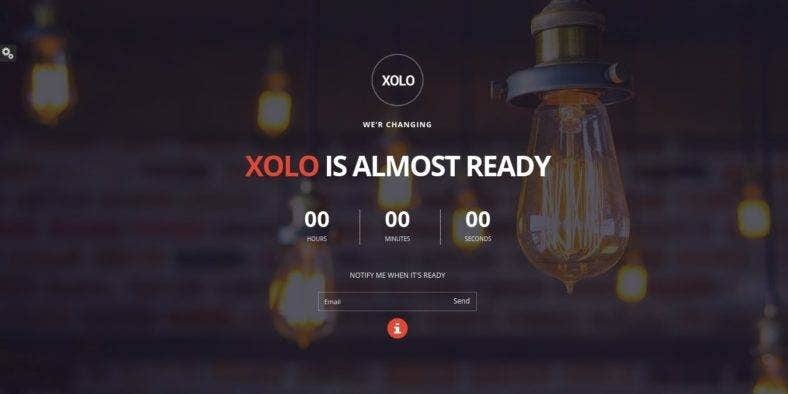 Built with W3C valid HTML5 and CSS3 code, this template boasts of extreme customizability, letting you build the perfect Coming Soon page that you want. 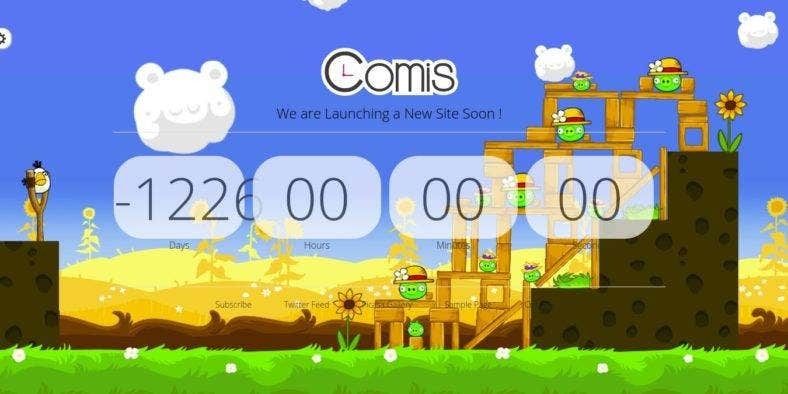 The next website theme you see above is Comis, a Coming Soon and Under Construction HTML page template that presents a simple and clean design which is easy to use as well as customize. With its custom full-screen background and unlimited color options, this theme enables you to create never-ending combinations of web design elements. Moreover, Comis also allows you to upload your own background image to make sure your Coming Soon or Under Construction page matches well with your brand image or website aesthetic. 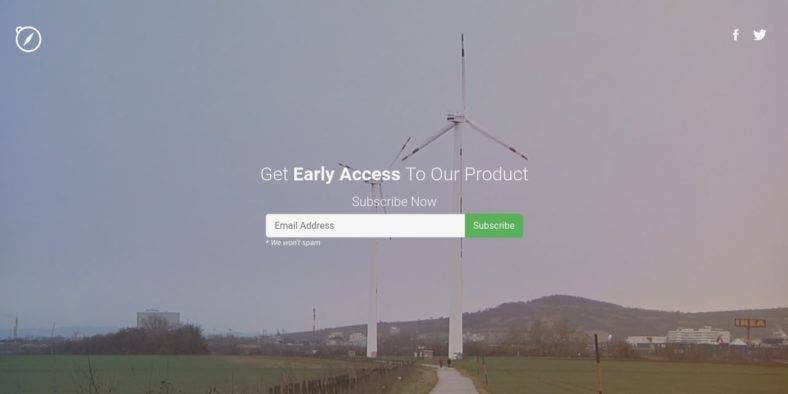 The theme also includes other features like email subscription and contact forms to allow you to keep in touch with your customers and inform them when your website is up and running. 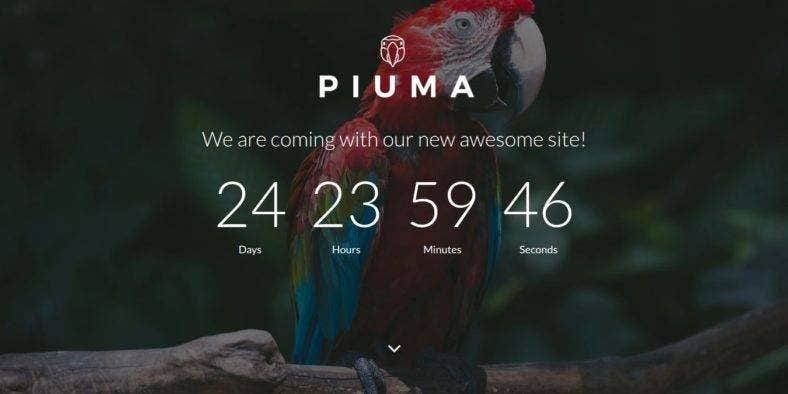 Another great choice for your Coming Soon page is this multipurpose Countdown theme called Piuma. Simple in design but robust in functionality, the theme comes with six various demos to choose from, for you to find just the right look for your web page which meets all your needs and requirements. It is a perfect fit for startups, small businesses, and even eCommerce websites. Built with Bootstrap, this template is packed with lots of awesome features like the fully responsive design with amazing CSS3 effects and animations, a full-screen background with slideshow and YouTube or Vimeo video support, a jQuery countdown timer, subscription and contact forms, social networking links, and an optimized code for easy customization. This dark-themed website template is a sophisticated and highly professional Coming Soon template that is suitable for any company, large business, or corporate website. Bourbon comes with several versions or demo layouts available along with either a countdown timer or text for you to choose from or easily customize. 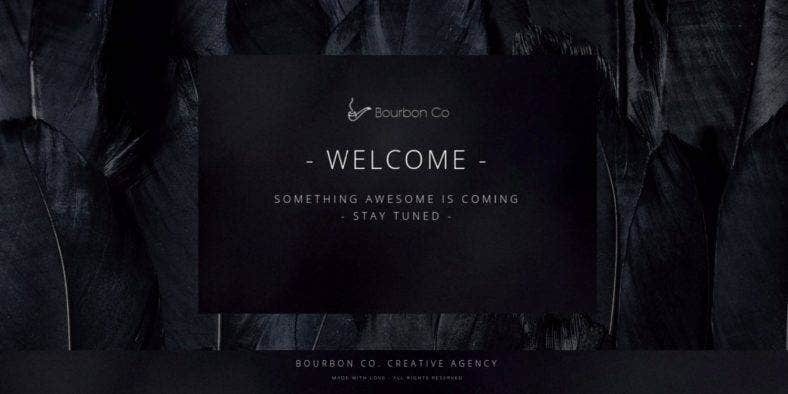 Bourbon is packed with lots of modern HTML5 and CSS3 coding, providing your page with a fully responsive design that is super clean and minimalistic. It also includes free Google Web Fonts with cool text effects, as well as 22 social media icons that you can integrate into your web page. It also allows you to change the logo, head text, and background with little effort. Vendo is a responsive HTML5 template that boasts of unique and powerful video backgrounds. It also provides image fallbacks for older browsers, a state-of-the-art feature that you and your visitors will definitely love. For more personality, it also comes with five color and style variations that you can choose from. 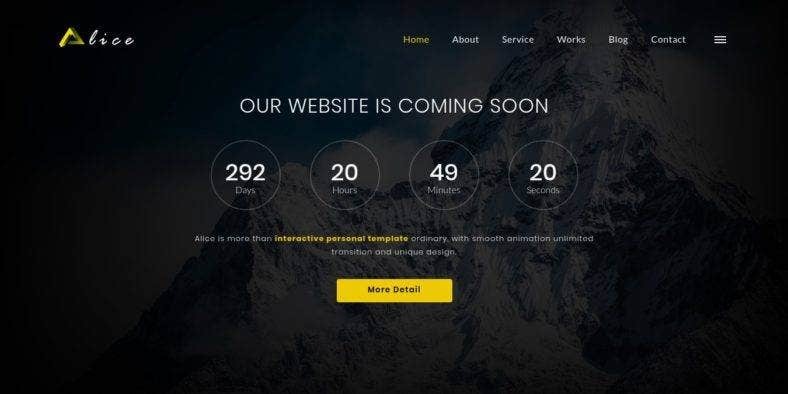 This hot and popular Coming Soon and Under Construction template also includes features such as a responsive layout, creative Coming Soon messages, a working PHP contact form and email subscription form with no database, a gorgeous countdown timer, Google Web Fonts, Font Awesome icons, and a number of animations and effects, among others. Next is Joseph, an HTML Coming Soon template with a clean and modern design, simple and responsive layout, and a beautiful and stunning overall aesthetic. It includes 15 design options, all integrated with the latest design trends and features. These include an animated background with either a Ken Burns effect, a static image, sliding slider, gradient overlay, and many others. Aside from these, the theme also comes in two versions, allowing you to choose between light and dark color schemes. In addition, Joseph features an animated pre-loader, nice and easy-to-set countdown timer, Font Awesome icons, Google Analytics, and so much more. A simple config file with very well-documented code allows effortless customization. Then, we have this responsive Bootstrap template for Under Construction and Coming Soon pages. 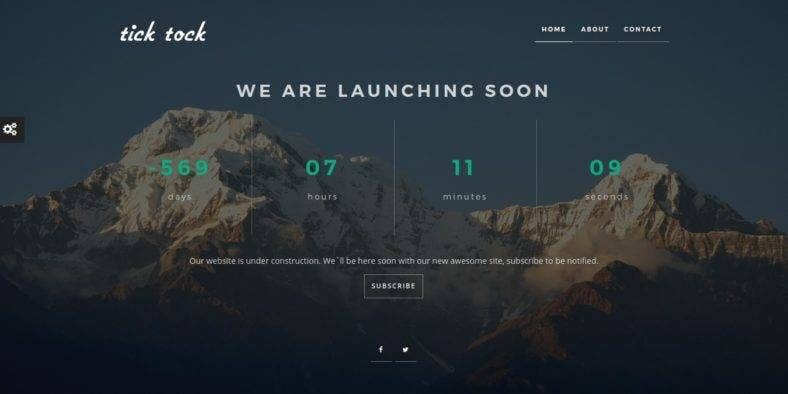 TickTock is developed with a valid HTML5 markup over the Bootstrap framework, so it boasts of a fully responsive layout which allows your web page to adjust quickly on all desktop and mobile devices. It has a very clean and minimal design and full-screen image background. Other features include a highly customizable design with five different background styles, over 400 Font Awesome icons, and Google Fonts. It also features a countdown timer on the homepage, a working PHP contact form and subscription form, Mailchimp integration, and many others. 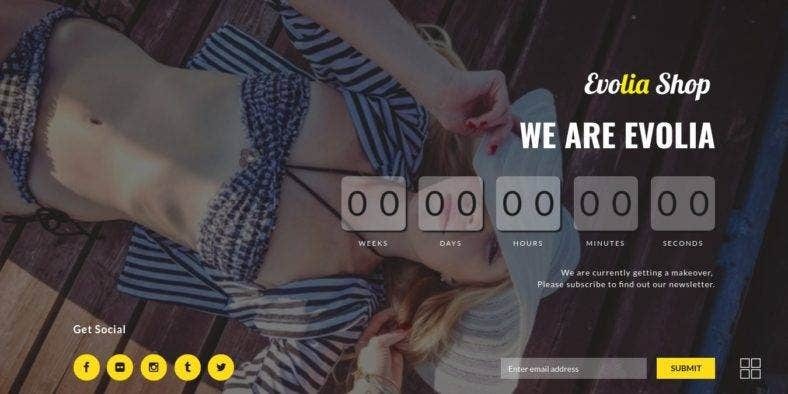 With this template, your Coming Soon page will definitely look professional. Here is xTime, another fully responsive Coming Soon template built with Twitter Bootstrap, so it is packed with lots of awesome features and cool options. It includes four various background options where you can choose between a full-screen single image, slider, YouTube video, or solid color backgrounds. Also, you can add a color or gradient overlay over each background. 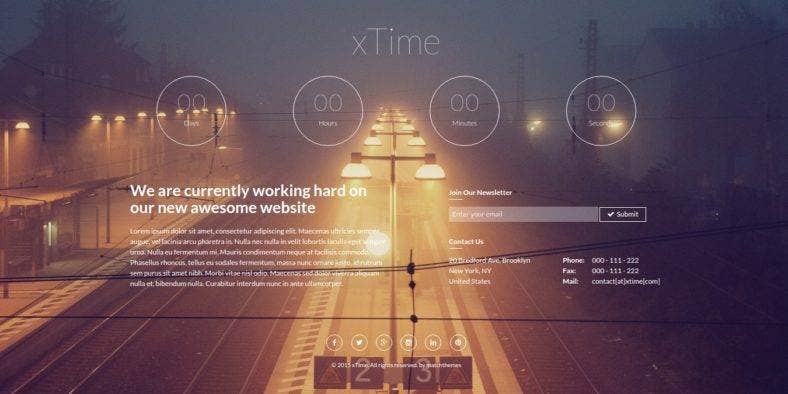 Furthermore, xTime comes with other features such as a jQuery countdown, a huge set of Google Fonts and Font Awesome icons, a working Ajax newsletter subscription form, and cross-browser compatibility, among others. This template has a clean and modern look with pastel color schemes that are perfect for creative websites like personal portfolios, blogs, etc. 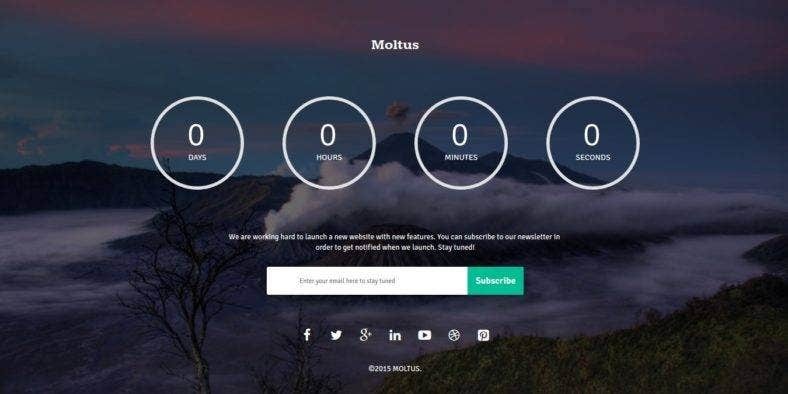 Moltus, on the other hand, is a Coming Soon template with a bold and dark visual aesthetic that suits many corporate and business websites as it looks elegant and professional. It has a clean and responsive layout that comes in two business home page versions and three Coming Soon pages, which are based on Bootstrap’s 1170px Responsive Grid System and W3C valid HTML. It has a pixel-perfect, modern, and creative design that integrates a number of cool features like the parallax background and responsive layout which guarantees a one-of-a-kind look for your Coming Soon pages. Moltus also boasts of a large collection of free Google Fonts and Font Awesome icons for its gorgeous typography, as well a working Contact Form. 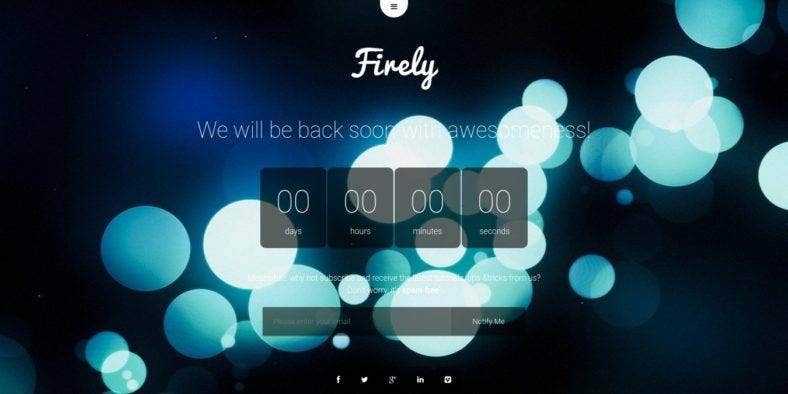 A one-page parallax Coming Soon web page template, Firely presents a creative and easy way to inform your visitors that your website is still in the works but is launching very soon. 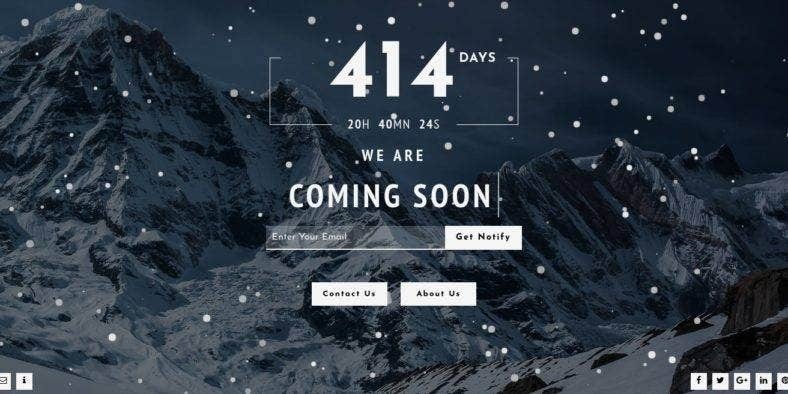 Its stylish countdown timer over a stunning background integrated with parallax and FireFly effects will surely attract visitors and keep them interested to come back when your website goes live. Aside from the ones mentioned, Firely also includes options to choose whether to include Bootstrap or not, as well as a number of several background options which include layered parallax, video, single image, or multiple image backgrounds. It also features a fully responsive layout, Ajax PHP contact form, Font awesome icons, commented code, and so much more. 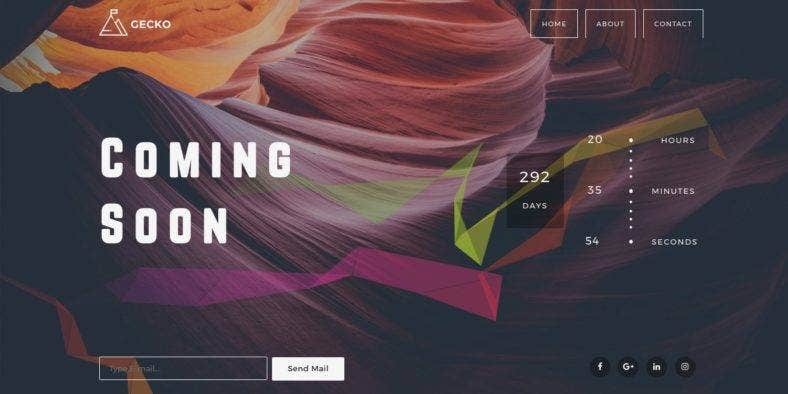 The next featured template on this list is Cronos, a Coming Soon and portfolio website theme with a minimal but creative design that is fully responsive as it is built with the latest Bootstrap framework. It is also packed with lots of customization options which include six layout variations, four background styles, three content sections, and three portfolio variations. Cronos is a flexible template that boasts of extreme functionality which comes from the cool features included in the theme. With a stunning jQuery countdown timer, a working contact form, social media icons, Font Awesome icons, and Google Fonts, among others. It is the perfect web design tool to keep your visitors on their feet with your new website launch. Another creative and professional Coming Soon template is this responsive HTML5 website theme with clean and minimal design but with great functionality. Built with Bootstrap and other modern web design technologies like HTML5, CSS, and jQuery, Compass has an amazing cross-browser compatibility and fully responsive design that adapts well on all devices. Compass is also comprised of many useful resources such as YouTube and Vimeo video background support, Mailchimp integration, a working contact form with form validation, and a well-documented code for easy customization.This template also comes in three versions, so you can have just the right template that suits your taste and matches your brand or image. 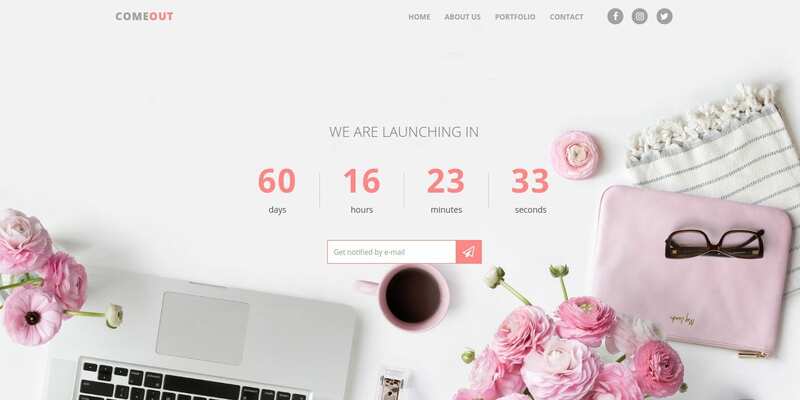 This premium multi-page and creative multipurpose website template for your Coming Soon page presents a stunning and beautiful design with a slew of powerful and robust features. 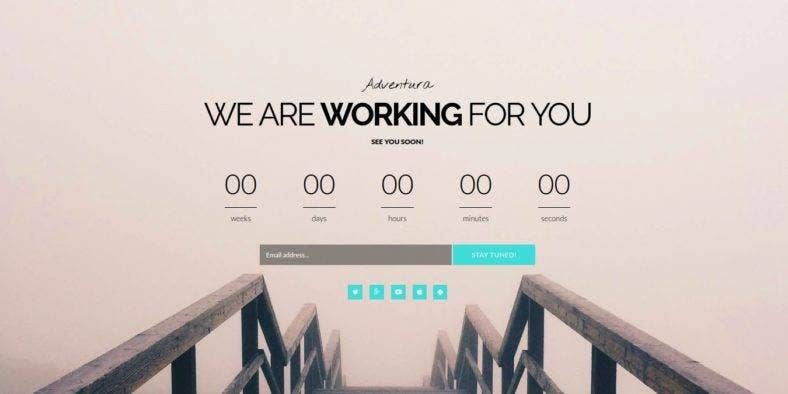 Adventura is built with the most recent version of the Bootstrap framework which gives you lots of possible adventures in terms of customizability and functionality. The theme has a fully responsive design which features a Vegas slideshow, text and FlexSlider carousel, parallax and full-screen video slider background, a bunch of CSS3 animations and effects, Google Web Fonts and Font Awesome icons, and so much more. It also includes a Bootstrap validator, Events and Blog sections, a pricing table, and many others. Another clean and minimal Coming Soon template is Xolo. 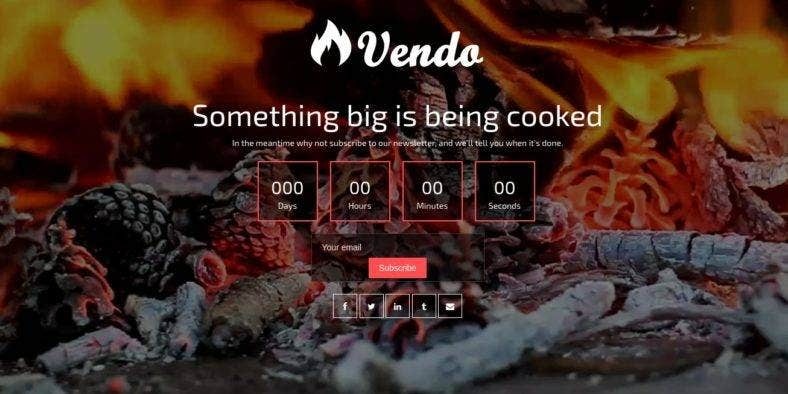 It is a fully functional website theme that is integrated with all the essential features of a Coming Soon or Under Construction page, such as a countdown timer and a subscription form. With a classic and standard design, this template is perfect for any kind of website of different business or personal niches. Xolo is also integrated with features that enhance the theme’ visual value and functionality. Among these features are various backgrounds to choose from, a bunch of animations and effects to add to your templates, a fully responsive design which allows your web page to look great on all devices, cross-browser compatible layout, and retina-ready display. ComeOut is a Coming Soon multipurpose Bootstrap website theme that can be used for multiple purposes and many kinds of website niches. It has a creative universal design that looks perfect on all major browsers as well as on all kinds of devices. Powered by the outstanding Bootstrap framework, it is built to introduce your website with a bang. The template comes with eight demo variations, which is a way to ensure you get all your required functionalities and business needs. Its clean and commented code lets you customize the template easily to fit your taste and suit your preference. ComeOut also features YouTube background support, working Ajax forms, particles effects, a stunning countdown timer, etc. Lastly, we have Lamont. This animated Coming Soon template has a creative and modern design that comes with four variations to choose from. Using this template will surely attract visitors and potential customers, with its powerful features and visually stunning aesthetic. It’s highly flexible and customizable, which enables the theme to be used for various types of businesses. What makes this template a great deal is the variety of features it includes. Lamont has a countdown plugin which provides a gorgeous and easy-to-set countdown timer, Mailchimp integration, and PHP contact form, which helps you generate leads from your web page, an image, video or slider background option for added visual value, team info, and so much more. Using a Coming Soon or Under Construction landing page before launching your website or online business guarantees a lot of benefits and advantages. Aside from letting people know and showcasing your products or services way ahead of officially operating your business, setting up a Coming Soon page builds up anticipation and hype which is a proven and effective way of marketing, be it in the physical or digital world. It also allows you to collect email signups which can be very helpful in building your web presence online. Through this list, you will be able to get a number of subscribers which will become the foundation of a leads database that you can send monthly newsletters to in order to keep these potential customers in the loop while introducing new products, features, deals, and promos until they decide to avail of your offerings and eventually become loyal clients. Definitely a worthwhile investment, Coming Soon pages allow you to direct your social media following (if you already have one) and convert them into readers of your new site. As a positive, they will also have something to share with their family members, friends, and own followers, which is a perfect way to grow your online community. You will see it becomes super rewarding to see even one or two remarks on your comments section once your site is up. So, make sure that you do not miss out on this one-of-a-kind opportunity and download one of these Coming Soon themes and templates right now. Each of these website themes and templates are guaranteed to provide you with all the benefits mentioned above. With the perfect elements and functionalities in their rightful places, you will definitely have a banging website launch soon.